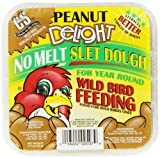 11.75 OZ, Peanut Delight Suet Dough Cake, Contains Rendered Beef Suet, Roasted Peanut Chips & Ground Corn, Softer Than Other Suet Products, Attracting A Larger Variety Of Insect & Grub Eating Birds Year Round. 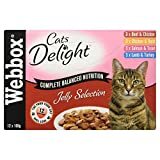 ~Work ‘n Chew~ food nutritionally complete excellent foraging food great meal or treat excellent conversion food Birds need nutritional variety and foraging excitement. Great foraging food Avi-cakes were designed to provide your bird with a variety of beak and tongue sensations. Your feathered friend will love holding, pulling and tearing at each square. We believe your bird’s food can be both exciting and nutritious. Nutritionally balanced Just for your Bird top avian nutritionists, veterinarians and behavioral consultants worked together creating Avi-Cakes. Avi-Cakes were specifically designed for the nutritional demands of birds: for iridescent feathers; for a strong beak and bones; and for bright eyes. Avi-Cakes are a mixture of premium seeds mixed 50-50 with nutritionally balancing pellets all held together with a great tasting molasses binder. Avi-cakes are perfect as a complete meal or as a special treat. Omega 3 & 6 Balanced Avi-Cakes Balancing the Omega Fatty Acids increases immune function. Generally, increased immune function helps the body’s ability to fight disease. Avi- Cakes are now Omega 3 & 6 fatty acids balanced. Balanced omega 3 & 6’s also improves the quality of the skin. More than ever, Avi-Cakes provide excellent nutrition for your loved feathered companion. Naturally Preserved Avi-Cakes Our veterinarians and nutritionist determined the best combination of natural preservatives, specifically mixed tocopherols and citric acid, to protect the nutrients of Avi-Cakes. Guaranteeing the nutritional quality you and your bird have come to expect from Lafeber Company. Keys to Making a Great Avi-Cake All the seeds and grains are hand inspected for cleanliness and freshness.